Belle Isle is a great example of how a good park can make a difference in a metropolitan area. It offers a beautiful view of downtown Detroit, lots of green space for picnics and dog walking, great roads for biking and jogging, and features like a beautiful white fountain and pond ringed by cherry trees. There’s also a conservatory and a nifty little aquarium — both of which are free to the public, although a donation is encouraged. That’s a great benefit for a family that is living on a budget and trying to stretch their paychecks. And, in fact, Belle Isle was packed with people today, who were enjoying the amenities and some beautiful weather. 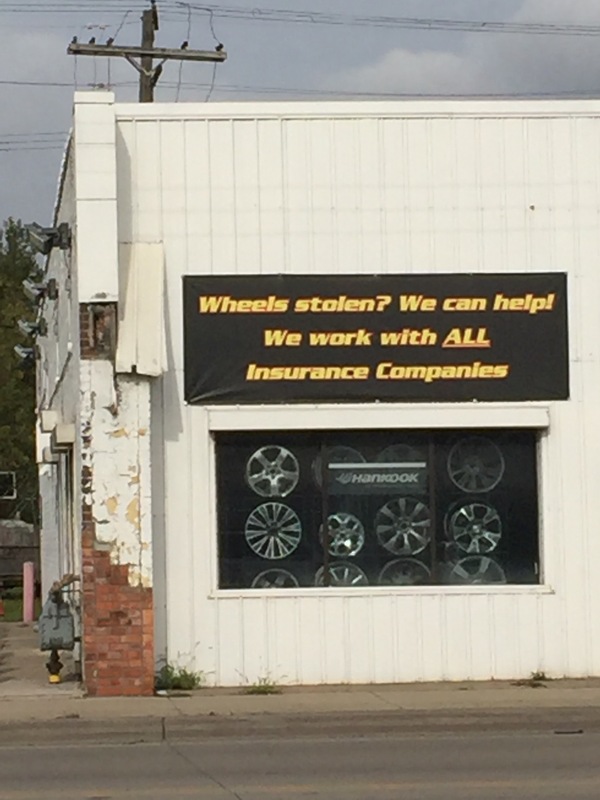 How many American cities offer these kinds of free benefits anymore? Not many. It’s one reason why the Detroit boosters are confident the Motor City will bounce back. It’s cold in Columbus this morning. It’s not really cold by absolute standards — at 32 degrees, it’s just at freezing, and a mere chilly precursor of the truly icy days that inevitably are coming this winter — but it’s an arctic blast by relative measurements, since only a few days ago the temperature was pleasantly in the 60s. When I checked my weather app to see exactly what the temperature was, I noticed that it’s a heck of a lot warmer in San Antonio, where Richard and Julianne and their dog Pretty make their home. Down there in south central Texas it’s a fine 66 degrees right now, and I can imagine walking out into the San Antonio surroundings, clad in t-shirt and shorts, and thinking that 66 degrees is a nice cool start to the day — good for a stroll on the Riverwalk or, in Richard’s case, a jog. Up in Detroit, Russell’s waking up to 36 degrees and a forecast of snow flurries. And if you add in siblings and uncles and aunts, we’ve got Heidi out in Huntington Beach, California where it’s 54 degrees and the forecast is for partly cloudy skies and a high of 67, and Aunt Corinne and Uncle Mack down in Savannah, Georgia, where its 50 degrees and the week ahead on the weather app features temperatures around 70 and lots of those bright, unclouded sun icons that you always like to see. So, right now, Columbus is the coldest place in the family, a solid 34 degrees more frigid than San Antonio. That’s why the weather app offers both the bitter and the sweet. It’s not great to be here at the coldest location, but one advantage of having a trusty weather app and a a family that is spread out from coast to coast and from north to south is we can live vicariously through whoever is getting the best weather right now. Later today, I think I’ll take an imaginary walk on Huntington Beach. 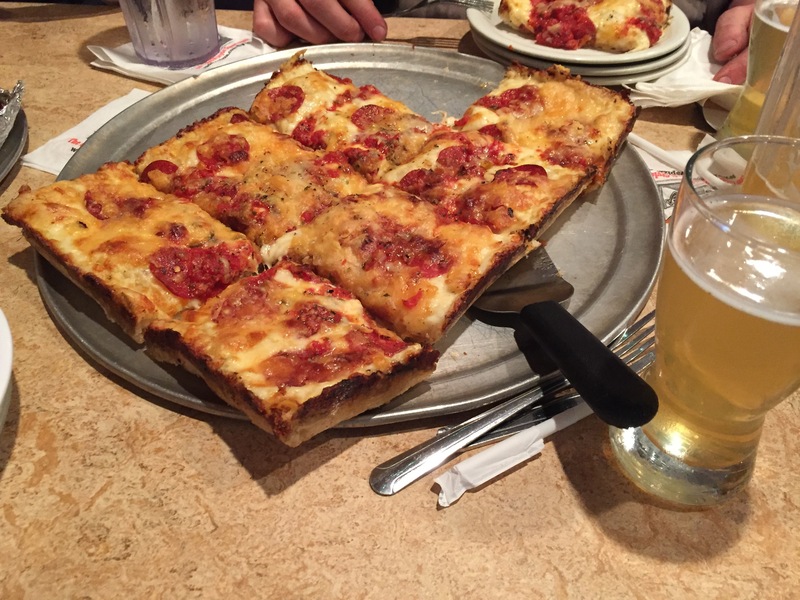 Last night we had dinner at Buddy’s Pizza, a Detroit institution for decades and also home to rectangular, “Detroit-style” pizza. Russell and I split a “Detroiter” — pizza loaded with meats and cheeses, with the cheese placed on top to maximize the meaty flavor and avoid charring the pepperoni. The Detroiter was fantastic. That should come as no surprise, because Buddy’s is frequently identified as one of the very best pizza establishments in the U.S. of A. The crust was perfection itself — light and crunchy, without the doughy gumminess you find in many “deep dish” pizzas — and the cheese on top approach really does enhance the flavor. We also enjoyed a pitcher of Buddy’s beer, a very refreshing lager with hints of citrus that went well with the pizza. I’m pretty sure there will be another trip to Buddy’s in my future. Yesterday we spent some time over at the urban farm, where it’s planting season. So far this year Emily and Russell have planted a number of black currant and raspberry bushes to join the apple trees and strawberry plants that remain from last year, and there’s a new beehive where the bees are busily doing their thing. You could say things are buzzing at the farm. It was a fine day, clear and not too warm, so we tried to put it to good use. 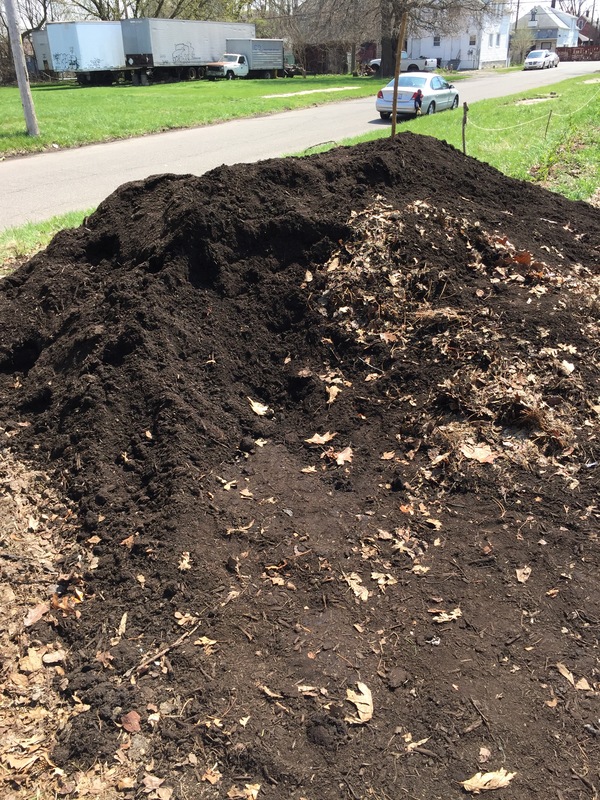 Russell and I spent most of our time shoveling dark, steaming topsoil from a huge mound into the back of his pickup truck, then transferring it onto the rows to be available for even more planting. 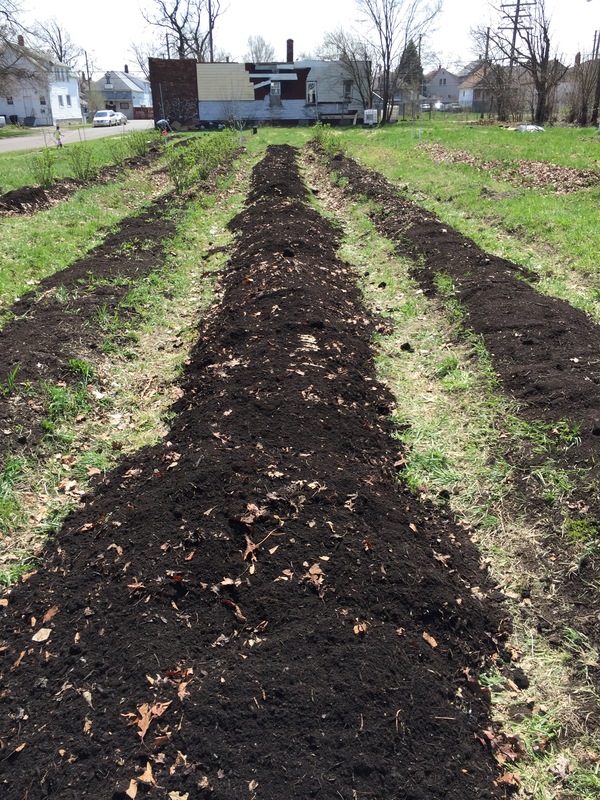 Thanks to the squatting, lifting, and twisting, I felt like I’d spent a few hard hours at the gym — except the farm effort also helped to produce two more furrows that are ready to go and made a noticeable dent in the topsoil pile. Not surprisingly, I slept pretty well last night. Russell’s friend Emily Staugaitis is one of those people who seems to be a kind of natural difference-maker. Where other people see challenges she can identify opportunities, and she’s not afraid to tackle a big project — like trying to set up an urban apple orchard in a depressed part of the Detroit area. One of Emily’s projects is Bandhu Gardens. It’s a collective effort that uses gardening to help Bangladeshi immigrants in the Detroit area use the green thumbs they developed while growing up in south Asia to connect with each other, and with local restaurants that are interested in fresh, locally grown foods. It’s also a way for Bangladeshi women to make some extra money, achieve more autonomy in their households, and get a taste of the business world in our capitalistic society. Last year, the Bandhu Gardens group collectively sold 120 pounds of greens, beans and peppers and 25 pounds of squash to restaurant accounts. They’ve also hosted “pop-up” dinners, including some at local restaurants owned or operated by women, have begun to offer cooking classes, and this year will be selling their produce at a large public farmers market in Detroit. It’s a classic American immigrant story, of how people come to our country and begin to make their way forward, drawing on their traditional experiences and know-how and applying them to realize opportunities in their new home. Sometimes, though, it helps to have someone who can help to point out the openings and make the potential opportunities into realities. Congratulations to Emily for helping to serving in that important role for some of the new arrivals to our land of immigrants!